We set out to leverage predictive maintenance based on data analytics in order to improve the reliability of steam boilers. Sensors, connected devices, and the Internet of Things (IoT) are changing our capabilities to gain insights into the inner workings of industrial machines in manufacturing. Nowadays, machines in factories are often equipped with a large number of sensors constantly collecting data points on a high variety of measurements. The data recorded can be used to improve monitoring and maintenance as well as optimise multiple aspects of these machines. One particular example of complex industrial machines that we have recently worked on are steam boilers. 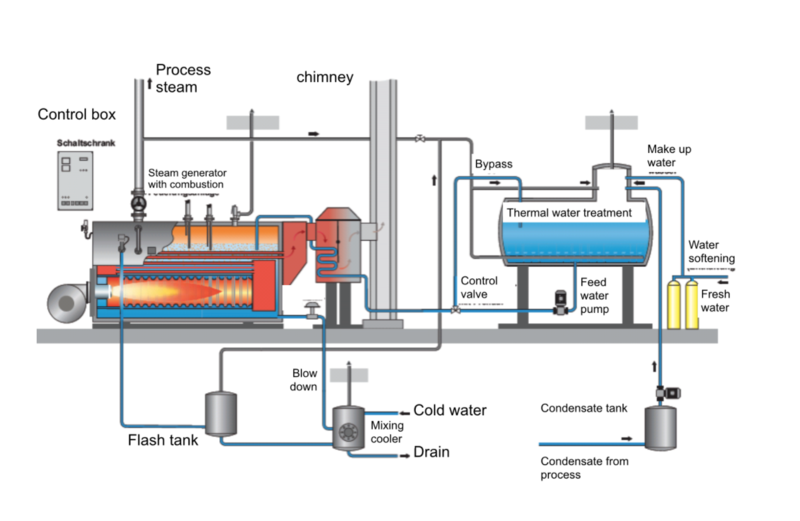 Steam boilers create steam by applying heat energy to water and are essentially used where (hot) steam is needed, such as in manufacturing, the food industry, agriculture, and many more. The long-term goal of this project was to optimise efficiency of the steam plant and build a system that implemented predictive maintenance and alarming. As a first step we aimed at analysing the data at hand in order to identify patterns and anomalies that could point to inefficiencies and failures of the steam plant. We were provided with access to data from an industrial steam plant from a large brewery. In this particular use case, steam is used in the form of process steam: In the initial phase of the brewing process, steam is used for heating up a mix of mashed malt and water, which produces a liquid called wort. Towards the end of the process, steam is used to heat up water to clean bottles. The steam plant contains hundreds of sensors recording a large amount of different metrics from all components of the plant such as the water tank, the pumps, the boiler, and the burner. Examples of measured data points are the amount of steamed consumed, temperatures, pressure, burner load, pump speed, and many more. Analysing the relationship between gas consumption and steam production shows that there is a linear correlation between the two, suggesting that, in general, the steam boiler is working efficiently. 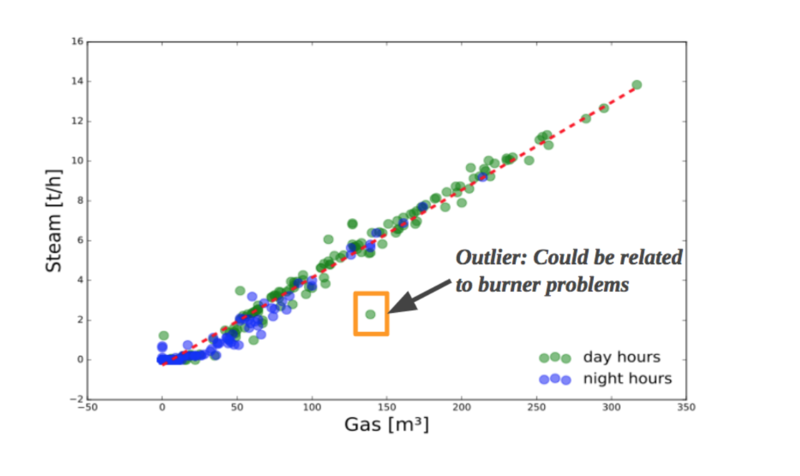 Nevertheless, we were able to detect outliers, indicating problems related to the burner. The detection of outliers as found in this example can be used to implement solutions for predictive maintenance and fix potential upcoming problems before they occur. We were able to identify occasions in which the burner was turned on and off repeatedly with a high frequency. These burner turn on/offs happen around 40 times within a period of around 8 hours, on a regular basis. At the same time, the steam produced within these events is negligible. These insights can be used in order to optimise or even eliminate these events, save fuel/steam, and potentially increase the lifetime of the burner. We detected inconsistencies between steam production and boiler pressure. In particular our analysis show instances in which the boiler pressure is high, but no to little steam is produced (a and b) and (these instances correspond to times in which the burner was turned off and on repeatedly), (c) the boiler pressure goes to zero. We were able to attribute a and b to the instances in which the burner was turned off and on repeatedly, and c to a potential error of the burner. This project illustrates the potential that the analysis on sensor data from industrial steam plants can have: With the use of advanced data analysis and modelling tools, patterns can be automatically identified and monitored that indicate, amongst other things, potential inefficiencies of the steam plant, or upcoming problems that can be prevented (predictive maintenance). According to the U.S. Department of Energy (DOE), a typical industrial facility using steam boilers has saving potentials in energy use and costs that range from 10 to 15 percent per year. The analysis presented here constitutes the first step towards optimising such an industrial steam plant. Since the start of the year WATTx is opening up for working with externals. Be inspired, validate your ideas or build ventures together with us today.